SpaceX’s billionaire founder, Elon Musk, is providing increasingly detailed previews of his plan to send colonists to Mars starting in 2024, more than a decade in advance of NASA’s Red Planet timetable. But there’s one part of the plan that’s not yet clear: how to bring people back. This is going to be mind-blowing. SpaceX is already laying the groundwork for privately funded Mars missions starting in 2018, with an assist from NASA. Musk’s company is benefiting from NASA’s expertise, and NASA will benefit from SpaceX’s experience with supersonic retropropulsion, which is an essential technology for landing large payloads on Mars. But the current plan calls for no money to change hands. Every 26 months, Earth and Mars are favorably lined up for a Red Planet journey, and Musk says he intends to take advantage of every opportunity. The 2018 trip will use a Falcon Heavy rocket send a Dragon spacecraft for a Red Planet landing. The 2020 trip will send at least two Dragons, loaded with experiments, Musk told the Post. Musk said 2022 would mark the first use of the Mars Colonial Transporter, a spaceship that’s big enough to carry scores of people to Mars. The first MCT would be uncrewed. However, it’s plausible to think that the craft could be pre-positioned at Mars to support the crewed mission to come, and the return trip to Earth. That’s the part of the plan that’s still fuzzy. In any case, Musk’s schedule calls for that first crewed mission to be launched in 2024, with a Mars landing in 2025. And unlike the Apollo missions to the moon, this would not be a short-term stay. Musk acknowledged that there are a lot of uncertainties to the plan. Neither the Falcon Heavy nor the version of the Dragon that would make the journey to Mars has been tested in space yet. 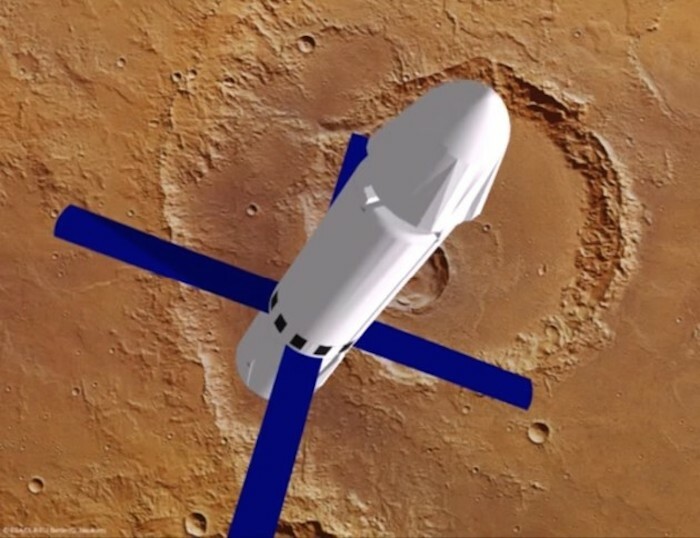 The design for the Mars Colonial Transporter has not yet been unveiled. And Musk has not yet figured out how to select and train the colonists. If SpaceX’s Mars program goes the way of the company’s other space programs, the timetable will shift to the right by at least a couple of years. But if Musk pursues this goal as doggedly as he’s pursued his past objectives, he’ll eventually make it to Mars.